The Tech softball team has started the season off extremely strong. In division play, the Jackets have won five games and lost four. That places them at fourth in the ACC, which houses some of the best teams in collegiate softball. Overall, Tech finds themselves 22-12 going into the last third of the season. The highlight of the season to date has been the fantastic tournament performances made by the team. In the I-75 Challenge, Tech managed to go undefeated, taking games against both Fordham and Hofstra. Overall, the Jackets have not come out of a tournament with a losing record. In elite tournaments like the River City Leadoff, the Big Ten Challenge and the Mississippi State Tournament, Tech has always managed to come out on top. Just this weekend, Tech managed to win the series against perennial NCAA Tournament qualifier UNC in Chapel Hill 2-1 to knock the Tar Heels down to third place with only three conference losses on the season. With wins against Virginia and Virginia Tech, Tech is competitive with top NCAA teams for the first time in years. Tech has been lead by excellent performances at the plate. Leadoff hitter and second baseman Breanna Roper has a knack for getting innings going with a .455 batting average and .530 on base percentage. Breanna leads the team with both stats and has a squad of heavy hitters to bring her in. Third baseman Katie Krzus leads the team in home runs and runs batted in with 11 and 31 respectively. She also leads the team in slugging percentage with .770. The back to back duo of Breanna and Katie has lead to many explosive innings and quick starts that puts the momentum in favor of the Jackets. 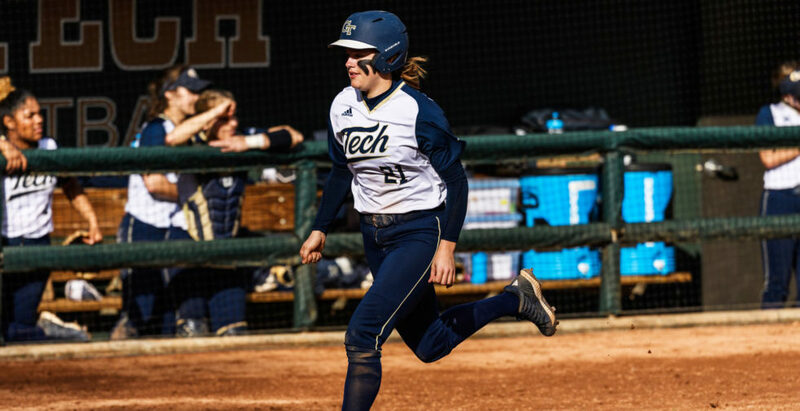 First baseman Tricia Awald, right fielder Crosby Huckabay, and left fielder Skye Webb round out the rest of the top of the lineup for Tech and have all been crucial towards the stellar offensive performance of the year. From the rubber, Morgan Bruce has had some fantastic outings. With 11 wins on the season and an amazingly low ERA of only 2.90, Morgan has been lights out against most rival offenses. Juniors Amber Johns and Brooke Barfield also have 5 wins apiece and have been core to the great success of the pitching rotation. Alongside a fielding team that has only made 31 errors on the season, the Jackets have bolstered a strong defense to defend the offensive lead gained by their offense. Head Coach Aileen Morales took over the Yellow Jackets last year and is on her way to starting a legacy. Last year, Morales led the Jackets to their first postseason appearance since 2014 and recorded five ACC series wins for the first time since 2011. With a sixth place finish in the ACC last season, Morales is looking to break into the top 4 and continue growing a winning program. As she closes in on back to back 25-plus win seasons, the previous Tech superstar is looking to make the team into a top tier program. If Morales continues with the same rate of growth, don’t be surprised to see Tech break the top 25 and become a top caliber program. With some tough games ahead, they have a chance to prove themselves.